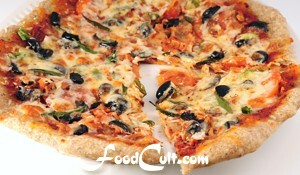 Galganov's Easy Recipe for White Pizza Dough! Put 1 cup warm water into the bowl and gradually sprinkle the yeast over the water allowing each pellet of yeast to get wet (this means: don't just dump the yeast into the water). Allow the yeast/water to sit for about five minutes (for the yeast to soften) then with the wooden spoon (or better - a whisk) beat the yeast until it is fully dissolved. Stir in 1/2 C durum semolina wheat and mix well. Add an 1 C whole wheat flour and mix very well - about 100 strong strokes with the spoon until the batter is nice and smooth. Stir in an additional 1/2 C flour - mix by hand once it becomes too stiff to mix with the spoon. Remove the dough from the bowl to a floured work surface. The Pizza adventure continues. This time it's in the form of a white pizza crust.